Measuring the User Experience provides the first single source of practical information to enable usability professionals and product developers to effectively measure the usability of any product by choosing the right metric, applying it, and effectively using the information it reveals. 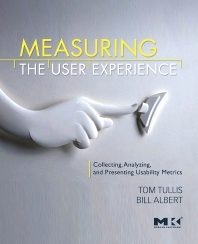 Authors Tullis and Albert organize dozens of metrics into six categories: performance, issues-based, self-reported, web navigation, derived, and behavioral/physiological. They explore each metric, considering best methods for collecting, analyzing, and presenting the data. They provide step-by-step guidance for measuring the usability of any type of product using any type of technology. This book is recommended for usability professionals, developers, programmers, information architects, interaction designers, market researchers, and students in an HCI or HFE program. Usability professionals, developers, programmers, information architects, interaction designers, market researchers, and students in an HCI or HFE program.